Very cool, bryanb! Something classic, something new...The GM LS 4.8L V-8 should be much less fuel thirsty than the Kaiser/Jeep 327 Vigilante V-8 (i.e., outsourced American Motors engine not to be confused with a small block Chevy V-8) that was optional in your J-truck. These bodies are truly one-of-a-kind and timelessly good looking! Great chassis, perhaps an open knuckle front axle with disc brakes in your future? That would provide a bit better turning radius and improved braking. What's the current steering arrangement? OE Gemmer worm-and-roller manual box? Linkage type power steering? Saginaw power steering? What an honor! Thank you, Moses! I got to know you in my early 20's through my early cj rebuilders manual, building my 59 Willy's! (Ill toss a photo up in the vintage section) That manual is in pieces, covered in greasy fingerprints. I still reference it often! Your manual and Mr. Granville Kings jeep bible are my favorite reads! The gladiator is a fun rig, as usual a work in progress. The front closed knuckle 44 will probably stay, only because I have a spare. It does turn like a toboggan though. I am however collecting parts for a disc conversion, should be almost identical to a 25/27 setup. I love the modern gm ls engine, I am so glad I did the harness rework myself. It really opened my eyes to the general simplicity of those engines. I would highly recommend one to anyone considering a swap. I ditched the worm and roller steering, it reminded me WAY too much of the Ross and cam I was in such a hurry to replace on my willys! I used an intermediate shaft and rag joint out of a 70's wagoneer and a similar year power box. I used a AA power steering box mount, and some home fabricating to create a mount that angled the box correctly. In hindsight I should have just found a mount from a newer j truck. Oh well, live and learn. I also used a newer column out of a wagoneer with a sweet leather wrapped steering wheel! Luxury! I used a tank and pump out of a 99 2 door s10 blazer. It maintains the required 59 or so psi to my vortec. Makes for easy to find common parts too. I will keep adding to this as I make changes, Lord knows, there WILL be changes! 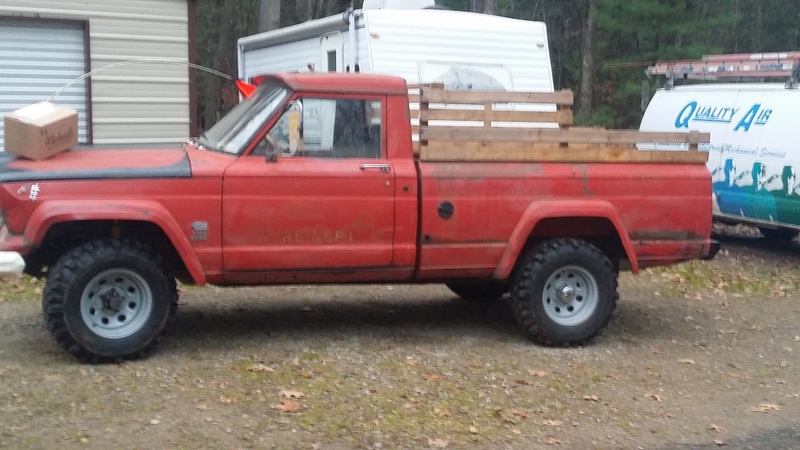 Terrific, bryanb...You're doing all the practical upgrades for this Gladiator while maintaining its classic look. Saginaw steering and disc brakes are the modern solutions for handling and safety...The Gemmer worm-and-roller is now very difficult to source parts, they are highly wear prone (guaranteed worm damage and roller teeth chipping over time), and you were wise to toss it! Sounds like the steering retrofit is done right and serves your needs well...Looks good, too!